Return of the Others continues the conflict between the Nightâ€™s Watch and what lives north of The Wall. The Wildling threat has been answered, but the brave men of the Nightâ€™s Watch are learning that far worse live in the savage wilderness of the north. Featuring characters like Mance Rayder, Melisandre, Old Bear Mormont, and the legendary Balerion the Black, Return of the Others will bring your A Game of Thrones deck to new heights of conquest and intrigue. 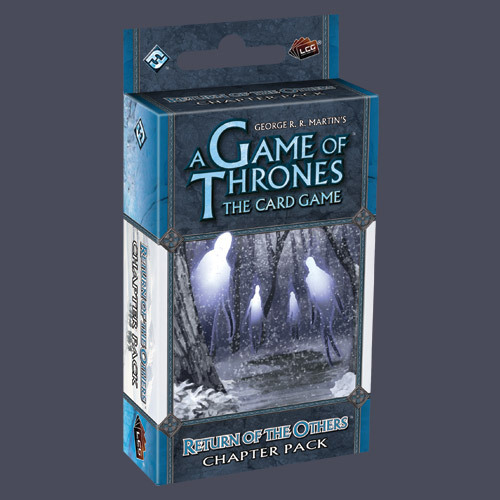 Return of the Others is the sixth installment in the Defenders of the North expansion to the A Game of Thrones card game, based on George R.R. Martinâ€™s bestselling A Song of Ice and Fire saga. This 60 card pack features 20 different never-before-seen cards designed to augment existing decks and add variety to the A Game of Thrones metagame. An A Game of Thrones: The Card Game core set is required to play. Contains cards 61-80 of the Defenders of the North series.